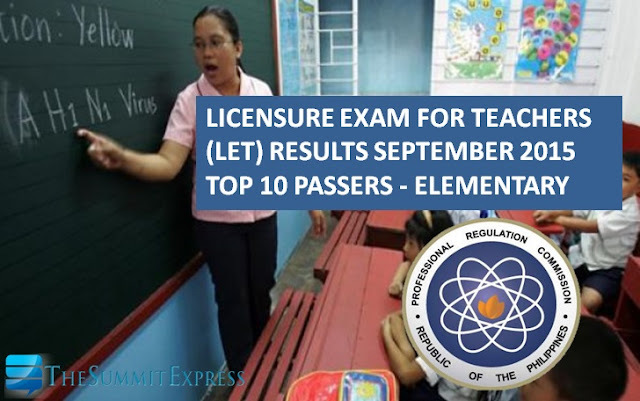 On this page you will find the list of top 10 passers or topnotchers for September 27, 2015 LET (Licensure Exam for Teachers) also known as Teachers board examination as the Professional Regulation Commission (PRC) officially released results in 48 days the exam. PRC named 21,461 elementary teachers out of 68,442 examinees (31.36%) who have passed the exam. Those awaiting the results for Elementary Level may view here the name of successful examinees who garnered the highest places for September 2015 LET board exams. This includes the rank, school and average rating. In August LET, there are 47 topnotchers who occupied the Top 10 list for Elementary level. The top 10 lists for Elementary was dominated by the colleges and universities from provincial areas. A graduate of Data Center College of the Philippines - Laoag City topped the board with 89.40% grade. Subscribe now to our E-Mail List, Follow Us on Twitter and Instagram or Like Us on Facebook to receive more updates.